1972: Roselle Keli`ihonipua Bailey began teaching hula in her home at Kaumakani, Kaua`i. She named this school KAHIKO HALAPA`I HULA ALAPA`I. 1974-93: KA `IMI NA`AUAO O HAWAI`I NEI served as kahu for the cultural sites of Keahualaka and Kauluapaoa at Ke`e, Kaua`i. During this time, members and friends cleaned the site, removed invasive plants, restored native species, and reactivated the area’s mana. By doing this, they made the sites available for po`e hula to visit and reconnect with their cultural roots. 1977: Roselle Bailey founded the non-profit eleemosynary research KA `IMI NA`AUAO O HAWAI`I NEI INSTITUTE, placing under its umbrella her hula school KAHIKO HALAPA`I HULA ALAPA`I. 1979: Sharon Ioana and Pohakalani Dawn Bailey, Roselle’s daughters, founded HULA ALAPA`I I NOHO I KUALI`I in Hilo. 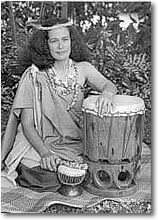 1981: Sharon Ioana Bailey moved to Maui, and founded HULA ALAPA`I MALUULUOLELE. 1982-85: HULA ALAPA`I O WAILANA was under the direction of Sherrie Wailana Hamamura of Kaua`i. 1985: Perle Puamohala Kaholokula founded HALAU MOHALA O KA PUA HAU HELE on Kaua`i. In 2000 this school joined KA `IMI NA`AUAO O HAWAI`I NEI. 1988: Pohakalani Bailey and her husband Paletti Mauga moved to Fatura Futi, Samoa. There she established POHAKA LA I HULA ALAPA`I O KA LANI. 1988: Eo, e Emalani i Alaka`i festival founded. 1991-1992: Jessi Keakawaiola Jardin founded HA`AWI HEMOLELE O KEAKAWAIOLA. 1994: Roselle and Jim Bailey moved back to Maui. Susan Puaokamakahala Ahlfield assumed leadership of KAHIKO HALAPA`I HULA ALAPA`I, and remained its leader until 1996, when she moved to Virginia. She then entrusted the school’s direction to Sally Jo Keahi Manea. 2000: Keahi Manea transferred leadership of KAHIKO HALAPA`I HULA ALAPA`I to Jane Kawaiolaonamolokama Garma. 2001: Lynn Kananiokeanuenue Roth founded KAHIKO HA LAPA I HULA ALAPA`I O KE ANUENUE in Greenbrae, California, and Luana Baumann organized LUANA NA MANU I HULA ALAPA`I A BERLIN in Germany. As part of its mission to educate the populace, Ka `Imi Na`auao o Hawai`i Nei Institute sponsors, organizes, and participates in many cultural events and exchanges in Hawai`i and throughout the world. For example, it sponsored La Ho`ulu `Olelo Hawai`i (Hawaiian Language Day) on Kaua`i. Twice a year Roselle Bailey travels to Germany, Austria, and Switzerland to instruct her students in those countries. Ka `Imi members regularly make cultural presentations to groups as diverse as The Friendship Force of Kaua`i, Lae `Ula o Kai canoe club, Kaua`i Community College, and the Pacific Traditions Society. Here is a list of some of the events and exchanges in which Ka `Imi has participated. In the late 1980’s and early 1990’s, Ka `Imi visited Aotearoa under the auspices of Te Whare Wananga o Waikato. Te Whare Wananga o Waikato also visited Kaua`i as guests of Ka `Imi. During the same period, Ka `Imi affiliated with the Saanich and Kwakiutl First Nations of British Columbia. Saanich and Kwakiutl visted Kaua`i as guests of Ka `Imi, and Ka `Imi members vistied British Columbia as guests of the First Nations. During one of these visits, students participated in events leading up to the formal opening of the 1994 Commonwealth Games in Victoria. They have also been on cultural exchanges with the Omaha people of Nebraska, and participated in several of the Pacific Arts Festivals. In 1997, Roselle and Jim Bailey travelled to Taumako, Solomon Islands as guests of Paramount Chief Koloso Kaveia. On Taumako, Roselle performed a Hawaiian blessing at the launching of three traditional vaka on 12 September. In 2001, Roselle Bailey and her students formally reopened the main gallery of the Ethnological Museum at Dahlem, Berlin. In 2003, members of Ka `Imi performed opening protocol for “Our Nation’s Crown Jewels”, an exhibition of native Hawaiian plants at the National Botanic Garden in Washington, D.C. In 2004, Ka `Imi members assembled at Heidelberg, Germany for a formal rededication of the Thingstatte. At the invitation of the Kolam Charitable Foundation, Roselle and her students visited Imayam School in Tamil Nadu state, India in early 2007. There they taught Hawaiian culture to pupils and teachers. En route to India, they performed protocol for the kupuna at Ban Non Wat Archaeological site in northeastern Thailand. Ka `Imi Na`auao o Hawai`i Nei has also participated in several hula festivals. These include: Eo, e Emalani i Alaka’i (1988-2009), the Prince Lot Festival (1986-97), and the Merrie Monarch festival (1973-83).